Snapshot Saturday is the creation of Alyce at At Home With Books. We post photos that we or family members have taken, we can’t just grab them from the Internet…what fun would that be?! Let’s get started! I live in an old house that was my Grandparent’s house. Everything is old here, including the residents…by age maybe, but not in spirit! I’ll talk about the Spirits another time. The floors are old, the refrigerator is old…41 years…and about to bite the dust I’m sad to say. One of my favorite things has always been the lilac bush that is so far away in my huge yard that I can’t tell from the house if it’s blooming or not. Sadly, due to some encroachment by other tree like things, the lilac isn’t doing very well. Year by year, the blooms get fewer and fewer. I was able to snip some off last week to share with my sister, Ele. Getting so close to them, smelling their aroma and seeing them right there in front of me, I was taken in by their beauty. I decided I needed to get some photos of the blooms which might not be blooming too much longer. I took several shots, but I think this one is the best. The wind was blowing this day and I actually thought it might be impossible to get a good closeup that was in focus. I’m very happy with this. Be sure to stop by at At Home With Books to see some of the other wonderful photos. what a beautiful photo, fran! wish i could catch a whiff of lilac to go along with it…one of my favourite spring scents. have a great saturday – i am OFF today (!) and it’s a gorgeous, sunny day here already! going to be a good one! Thanks, Cathy! I love the scent too. It’s beautiful here and we’re off on a short overnight trip. Should be fun. Enjoy your day off! It looks so pretty – just as pretty as it smells, I can imagine. Thanks for sharing, Fran. Thanks, Joy! I was so happy with the way it turned out. Have a great day! Fran, how picture perfect and love the smell of these. Thanks, Diane, I love the way they smell too. I was very happy with this one. Have a great day! That is such a lovely shot I can almost smell it on the other side of the world! Our scents are rotting leaf mulch and wood smoke! Thanks, Brona, I thought it was one of my best. Have a great day over there on the other side of the world! That is wonderful! We still are dealing with snow.. no blooms here. I wonder if we will even get them this year? Sheila, I have faith, you’ll get Spring soon. And some pretty flowers. Have a great weekend! 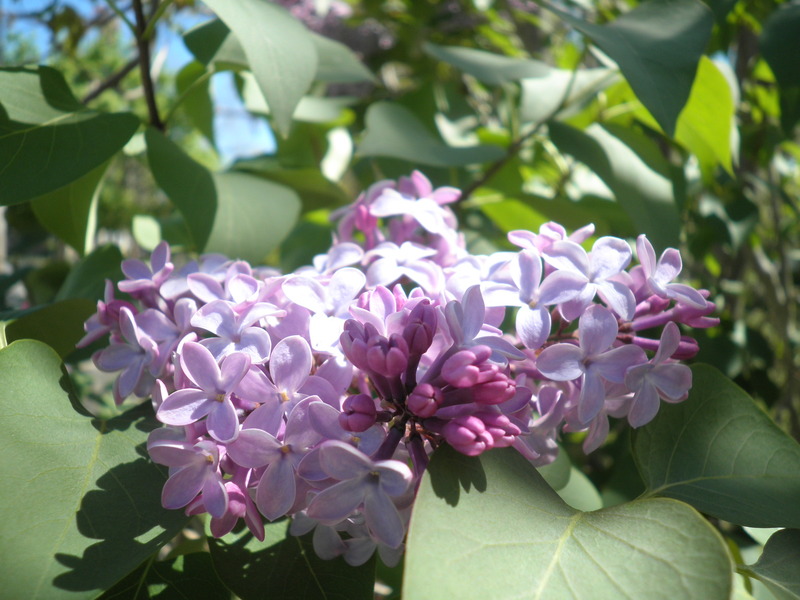 Oh, I adore the scent of lilacs…and they remind me of old bookish tales I loved in childhood…like Under the Lilacs, by Louisa May Alcott. Laurel, they’re one of my favorites, too! They are very pretty! I’ve tried to take close-ups of flowers in the wind – it’s difficult. Thanks, Alyce. It was tricky. I was really happy with this one though. Thanks, Paulita, glad you like them! Oh, nice you have flowers already. Our trees are late this year, they are just starting to bloom. They were so beautiful, Leslie. Sadly, they’re mostly gone now. I love lilacs. I cut two sprigs to enjoy inside..all I thought I could spare. I think I will go out and try for a closeup like you have here. Lovely, by the way. Thanks, Anne and thanks for visiting. I should go out and bring some in before they’re all gone. 41 years for the fridge…clearly built to last! I was amazed when I found the paperwork and saw just how old it was. I had guessed about that many years, but was glad for the confirmation. Such a lovely shot. I imagine it does smell wonderfully too, a shame you can’t see it from the house. Thanks, Louise! Glad you like it! Love your photo. My neighbour has a lilac, and I noticed today that it is just starting to bloom. I think it is a bit later than normal this year because of the cold weather. Thanks, Ginny! They always been one of my favorites! Very pretty! Could you move it closer to the house and away from everything else? It would be a shame to lose it. Thanks, Vicki. I suppose I could but I’d need to find someone who knows about those things. Sometimes, moving something that old can kill it. I’ll have to look into it. Can’t wait to smell their fragrance! Thanks, Nise’. I just love to smell them. Beautiful picture,lilacs are beautiful and smell heavenly! I hope that you can find a way to save the bush. I’m amazed that your grandparents refrigerator is 41 years old…amazing!! Glad you like my photo. I think removing some of the things that have grown up will do it. Gotta get my yard boy on the job. 41 years! That is pretty crazy…I can’t imagine anything lasting that long anymore, unfortunately. It is amazing, Ameena. I was stunned when I found the paperwork and realized how old it is. If it can just hold on for a little longer…that’s all I need. Have a great day! I didn’t know you lived in your grandparents house. That’s pretty cool. Love the photo! Sorry I’ve been mia. I’ve barely had time to blog or read blogs, boo! I’ve missed you, Stacie, but sometimes we need to get on with life. Take care and stay in touch. You’ll be back when it works out to be back. Hugs! I remember a garden we used to have that was full of lilacs. Beautiful. The house is not old, nor are the contents. They are matured, and possibly antique, but they are not old. Rob, you always know how to turn something into a positive. Thanks!